Living in the moment might be good psychology, but it can be very limiting. So I decided to take a step back in time, to the Victorian era at Caledon Victoria City (174,29,45). While there I met up with Master Shipwright SimplyAmy Iwish, who owns Wicked Kitty Industries (W.K.I.) We talked about her latest projects, the Steamrunner Full Mark 1.0 and the soon-to-be released Leviathan. 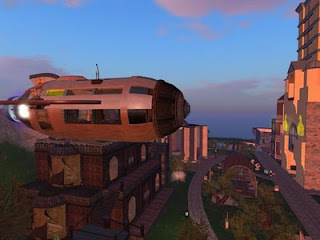 We started at the office shared by Black Kat Studios, W.K.I., and Dragentek, located at Caledon Victoria City (153,30,22). But don’t be surprised if you get teleported to the gazebo in the town square. Just walk through the Shopkeepers Association, through Goode Garden Books and Art, and turn left. You can’t miss the Steamrunner moored at the building’s rooftop. Iwish began building her airships shortly after coming to SL, nearly three years ago. A fan of Jules Vern and H.G. Wells, it was natural for her to build in a Victorian steampunk theme. Both the Steamrunner Full Mark and the Leviathan are fully flying airships, and they have the engine sounds to prove it. 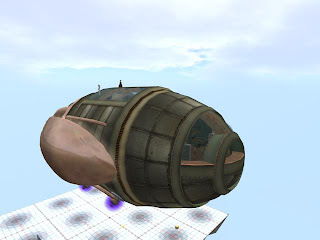 First we looked at the Steamrunner, which is 246 prims and can be flown or used as a skybox home. This one is owned by resident Kat Burger, who owns Black Kat Industries. She made the Steamrunner’s furniture, too. The ship is roomy and comfortable, with a fireplace in the lounge. The bed and couches have pose sets, the windows have privacy options, and the boarding ramp raises and lowers. It can even go into hyper jump/warp! Iwish’s newest project is the Leviathan, the first of a new line she has planned. Iwish described it as “a 35x35x70m, 256 prim one link set non-physical fully flyable ship”. I appreciated the size better when we viewed it from outside. Someone who is standing in the front part of the ship will be out of chat range from anyone at back of ship. An evolution of her earlier work, the Leviathan is incredibly detailed. The furniture is by Kat Alderson, and nearly everything is scripted. There is even a telescope that views the sky when you sit down! As we toured the airship, I was impressed by the detail and spaciousness. In addition to the large lounge, there are bedrooms for guests, crew or labs. In the Captain’s quarters, along with the usual bedroom furniture, there is also a writing desk and working chest of drawers. The writing desk even has a sculpted pencil and an envelope closed with a sealing wax! The engine, which is visible from a viewing window as well as the engine room, is robust, with plenty of steampunk flavor. Stairs lead from the main area down to the engine room and pass through the hangar bay where a smaller plane will be stored. The specific release date of the Leviathan has not yet been announced, but it will be soon. Iwish has already test flown it. Now she is putting in the finishing touches. I have already added it to my wish list.